Separated bicycle infrastructure is certainly nothing new. 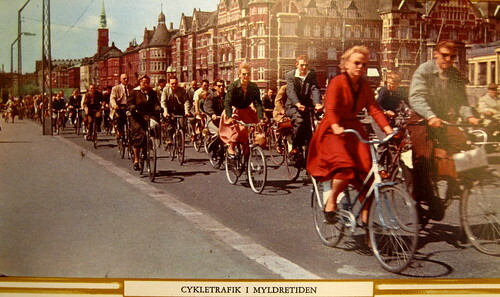 It's been around since the very beginning of bicycle culture. The Guardian is reporting today that it is 75 years ago today that the UK opened its first bike lane/cycle track. Indeed, as The Guardian writes, infrastructure was in place in Holland, as well as Denmark, waaaay back in the day and people used them in great numbers. One of the world's most impressive separated bike paths was built to connect Pasadena to Los Angeles in 1900. At that time 20% of all trips where made by bicycle in the Los Angeles region so the construction of the eight-mile Arroyo Seco Cycleway - an elevated, multilane, wooden bike path, complete with streetlights and gazebo turnouts – was a given. When the first leg opened, swarms of bicyclists handed over the 15-cent toll. A Los Angeles Times commentator gushed that the countryside it passed through "is the loveliest in Southern California, the route having been chosen with an eye to scenic beauty as well as to practical needs." Here's the full article from The Guardian: 75 years after the UK's first cycle lane opened, the same debate rages on. In contrast to separated infrastructure, the opponents have yet to show us that any alternative theory encourages great numbers of people to cycle, allowing society to reap the many rewards involved.